The farmers are happy over excellent growth of tender litchi and expecting a plentiful production of the fruit with better profits in all five districts of Rangpur agriculture region this season. Officials of the Department of Agriculture Extension (DAE) said outstanding blossoming in litchi trees followed by smooth formation of tender fruit amid favourable climatic conditions has made farmers hopeful of reaping huge profits this time. They said over 95 percent of litchi trees in small, medium and big-sized litchi orchards and homesteads on about 1,750 hectares of land have bloomed massively this season in the region. Talking to BSS, bigger litchi grower Hasanul Haque of village Balapara Dilalpur in Badarganj upazila here said he has been cultivating litchi on commercial basis on his orchard for the past 12 years and never incurred any loss. “I have cultivated Madrazi and China-3 varieties of litchi in my orchard on three acres of land and tender fruits are growing superbly at this fruit setting period this season,” he said. Farmers Ekramul Haque of the same village and Shahidul Haque of nearby village Balapara have cultivated Madrazi, Bombay and China-3 varieties of litchi on their orchards of 70 decimals and two acres of land respectively. They are now busy in nursing their growing tender litchi in their orchards with a hope to get bumper production of the seasonal fruit this season if the climatic condition remains favorable during the next five to six months. At the same time, bee farmers had set up over 200 honey bee boxes in these three orchards on lease-basis and already produced 1.50 tonnes of pure honey worth Taka 5.25-lakh this season, the farmers said. Farmers Abdul Baten and Harish Chandra of village Salaipur in Pairaband union of Mithapukur upazila here said they have cultivated China-3 and Madrazi varieties of litchi on their orchards on one acre of land each this time. 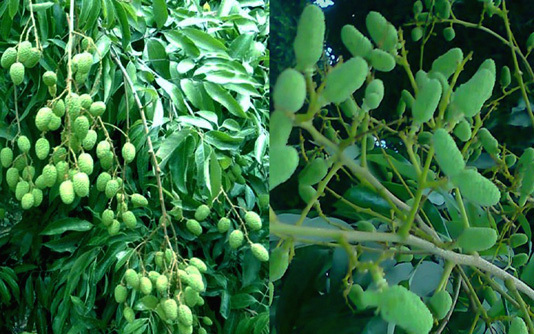 Similarly, farmers Abdul Hye and Nurur Rahman of Pirganj and Taraganj upazilas in Rangpur and Lokman Hossain and Zahid Hossain of Syedpur upazila in Nilphamari and Kurigram Sadar upazila hoped to get bumper litchi output this season. The farmers said litchi farming on orchards has become highly profitable than many other crops and they generally earn Taka 1.50-lakh to Taka two-lakh on an average per acre of land annually through litchi cultivation. Talking to journalist on Sunday, Horticulture Specialist of the DAE at its regional office Agriculturist Khondker Md. Mesbahul Islam said litchi farming is expanding every year bringing fortune to many farmers of Rangpur agriculture region. Increasing number of farmers are showing keen interests in expanding litchi farming on commercial basis after getting repeated bumper production with excellent market price in recent times. The farmers are mostly cultivating high yielding, hybrid and local varieties litchi like China-3, ‘Bedana’, Bombay, ‘Mozaffarpuri’, Madrazi and ‘Kanthali’ after getting repeated bumper production and lucrative price in recent years. “The farmers have become busy now with agronomic management in litchi orchards,” he said suggesting them to spray 80 percent Sulphur on litchi tress if mite attack was found following rise in temperature during fruit formation stage. “The farmers can also spray ‘Mentozeb’ or ‘Propikonazole’ as per recommended dose to prevent powdery nose mildew or anthrax those might attack young leaves or tender fruits following rise in temperature amid cloudy sky,” Islam added. Regional Additional Director of the DAE Agriculturist Md. Shah Alam expressed satisfaction over smooth fruit formation following excellent blossoming in litchi trees and predicted bumper production of the fruit this year in the region.